Hydraulic Press for handling of WASTE-Paper, Corrugated Boards, Stationery (sharedded / Un - sheddded). Plasti / Flims etc. Hydraulic device, compact in design, ideally suited for the pressing of said WASTE and manually bundling the presssed bales for saving in storage space, transportation and manpower. Easy simple operation of handling waste by sinlgle person. The bales ensure higher yield price. Conveniently located Control Panel. One time activation of Switch for downward & upward movement of pressing platen. The pressing function can be aborted for refilling fresh Waste material. Tight wrappping of compressed waste and bound with Cords / Plastic straps / Hoops (wire) for ease of - handling for onwards stacking / trasportation, two (Front) Strapping Grooves for bundling incorporated. Power saving Device (built-in), the motor switches off automatically on attaining the set pressure or in Reset position of the Moving Platen. The downward movement stops automatically on attainig the set pressure. Front loanding of paper waste- material. Loading Area Widened by 22% over earlier models. Convenient removal of bales with the help of unique design - Ejector Device for removing the bale. Spring Loaded Switch for up / downward travel in Manual Mode. The travel stops automatically with the help of the limit Switch in reset (loading) position. 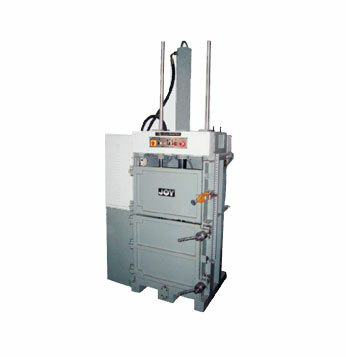 Baling Press can be supplied with 3Hp Motor (single phase supply) for tonnage upto 10-12 Tons.